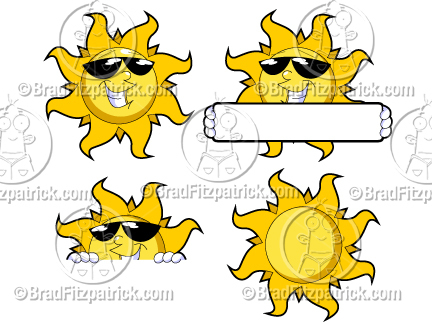 Cartoon Sun Clipart Picture | Royalty Free Sun Clip Art Licensing. they do not have my logo watermark on them! All 24 Cartoon Sun Clip Art Character Poses Below are Included in this Collection! 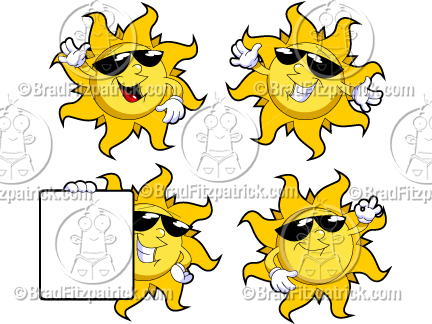 What Do You Get When You Buy This Cartoon Smiling Sun Clipart? When you buy clipart images from this website, you get FOUR very high-quality image files of each image which are listed below. These image formats are industry standard and will suit all of your possible needs. What is a Royalty Free License? Royalty free licensing means that you pay one low, flat fee and you can use the artwork as much as you like on numerous products, forever! This is definitely the way to go if you want a high quality illustration, but you are on a limited budget (aren’t we all! :) Once you purchase a royalty free license for the cartoon Smiling Sun above (and/or other cartoon clipart pictures on this site) you can use the art with very few restrictions. For example, my stock illustrations work perfectly on your website, iphone apps & mobile devices, business cards, t-shirts, board games, software, video games, Facebook pages & applications, scrapbooking, stationery, marketing & advertising collateral, TV shows, business packaging, labels, non-copyrighted logos and many, many other uses. 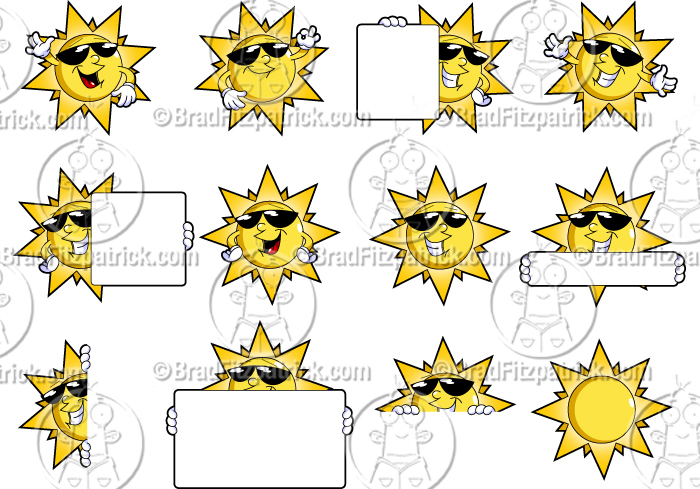 What CAN’T You do With My Smiling Sun Cartoon Clipart or Other Pictures on This Site? You CAN NOT use this Smiling Sun clipart in any way without first purchasing a license for it. You CAN NOT copyright or trademark anything that contains this Cartoon Smiling Sun picture. 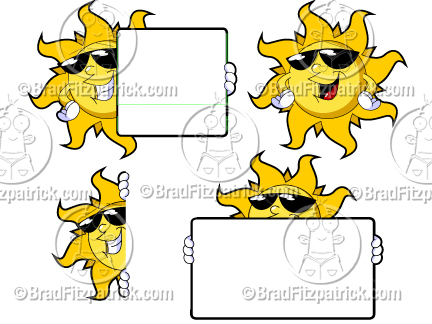 You CAN NOT sub-license, give away, share or otherwise redistribute copies of this Smiling Sun clip art. You CAN NOT use my clipart art for online "print-on-demand" products for public sale (however, private sale of these items for your company or event is certainly acceptable). Smiling Sun Cartoons, Pictures of Cartoon Smiling Suns, Smiling Sun Graphics, Pics of Cartoon Smiling Suns, Cartoons, Smiling Sun Cartoon Pictures, Smiling Sun Images, Cartoon Smiling Sun Images, Cartoon Smiling Sun Pics, Cartoon Smiling Sun Drawings, Vector Smiling Sun, Smiling Sun Vectors, Mascot Smiling Sun Clip Art, Smiling Sun Mascot Clipart, Drawings, Cliparts, Line Art, Icons, Cartoony, E-learning, Character Design, Stock Art. Once your order is completed, you will be sent an automated email that contains a link to download the high-quality image files in each of the 4 formats listed below. These image sizes and formats are industry standard and will suit all of your possible needs.